Nishi is introduced by Anne de Raad around one o'clock in the afternoon and so the lecture starts. Nishi starts the lecture thanking all attendees for still being MSX users. He tells the listeners he gave up MSX himself 10 years ago. He made a mistake he says, because a friend of his invited him 2 years ago (in 1999 that should have been) to a MSX fair in Tokio. Nishi was very suprised MSX was still alive. He says MSX should be back and starts telling about his progress as a computer engineer for ASCII corp. Nishi tells us he did not finish his study and dropped out of school. After working for ASCII corp for a couple of years he picked up his study again and got his PHD (dr.) degree. A few years later he met Bill Gates, who he proudly told about his PHD degree. After which Gates asked him how much he had payed for his degree. With this last joke, Nishi got full attention of the audience. Back in 1981 Nishi was in the IBM team to design computers. At that time Microsoft asked IBM to create a computer. The IBM computer produced at that time used a Z80 cpu. Nishi asked IBM to get the Z88, but IBM did not want to. Nishi had already designed a office computer and a portable computer for IBM at that time, the only computer that was missing was the home computer. The first thing that came up was: IBM hardware, so IBM software. But Nishi felt that was not a good idea at all. For example, Nishi says, take a look at VHS videotapes. It is a standard used by many companies. 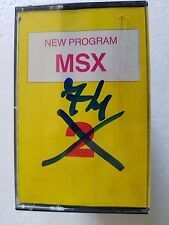 MSX should be like VHS, a standard that will be adapted by many companies. 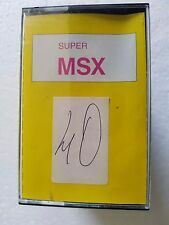 But the MSX should be better than existing computers, Nishi felt, so it should have better graphics support, at that time the best was MCGA and CGA. Nishi found those techniques very poorly and wanted something better. So they decided to create a new chip, but they did not have the skills to create microchips. Nishi and his team went to Yamaha, who could make the technology. So Yamaha would do both graphics and audio. Also Nishi felt that computers were too expensive at that time. To get the price lower, the machine should have less components. Nishi's goal was a one-chip solution.